I haven’t posted in quite some time. I moved and didn’t have internet for a week. I know, how can one live without internet. The struggle was real & I basically used all of my data allotment for the month in 5 days. Sad. Anyways. In those internet/cable-less days I did some cooking. We were back to the real world come Sunday & couldn’t celebrate in any other way than with The Walking Dead. Zombie Love. So I cooked. Well I pulled my brand new orange Bella crockpot out & all was good in the world again. I whipped up my favorite white chicken chili recipe to date. Legit, this chili is to die for. I might have actually died the first time I had it. No joke. My roommate back in Utah made a similar chili, but I never got a chance to get her recipe! I was lucky enough to watch her make it a number of times & tried to create my own version. Not to toot my own horn or anything, but TOOT TOOT. It’s always a hit, every single time. My mom makes it at least once a week for the entire family. 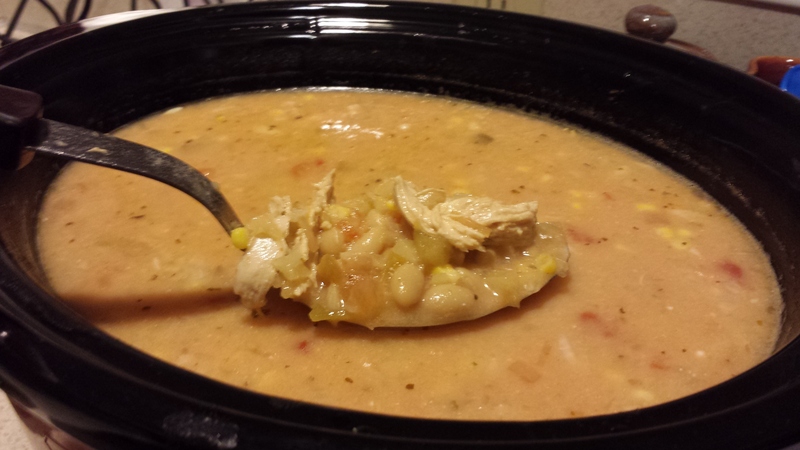 Without further ado, see below my recipe for Pineapple White Chicken Chili! Fill pot with enough water to cover chicken breasts completely. Heat water to a boil & add chicken breasts. Cook until no longer pink, approximately 10 minutes depending on size of breasts. Meanwhile, turn crockpot on low. Dice the onion and add to the broth mixture along with the corn kernels, great northern beans (juice included), crushed pineapple (juice included), salsa & green chilis. Once chicken is done being poached & no longer pink, shred the chicken or cut into bite size pieces. Add to crockpot. Cover the crockpot with lid & let it cook for approximately 4 hours on low. After 4 hours turn the heat up to high & add the sour cream. Mix until mixture is creamy (pinkish in color). Continue cooking for an additional hour. Top each bowl with some shredded Mexican cheese & enjoy with tortilla chips!